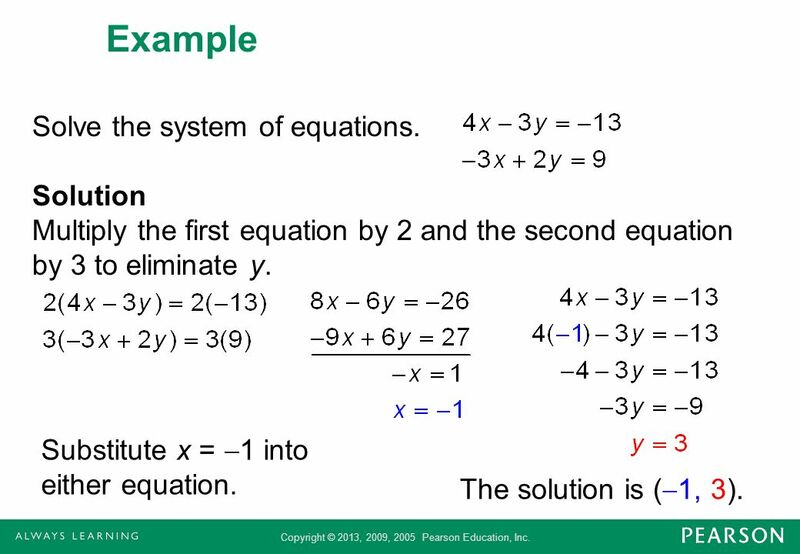 3 Example Solve each system of equations. a. b. c. Solution a. The first equation is solved for y, so we substitute 3x for y in the second equation. Substitute x = 7 into y = 3x and it gives y = 21. The solution is (7, 21). 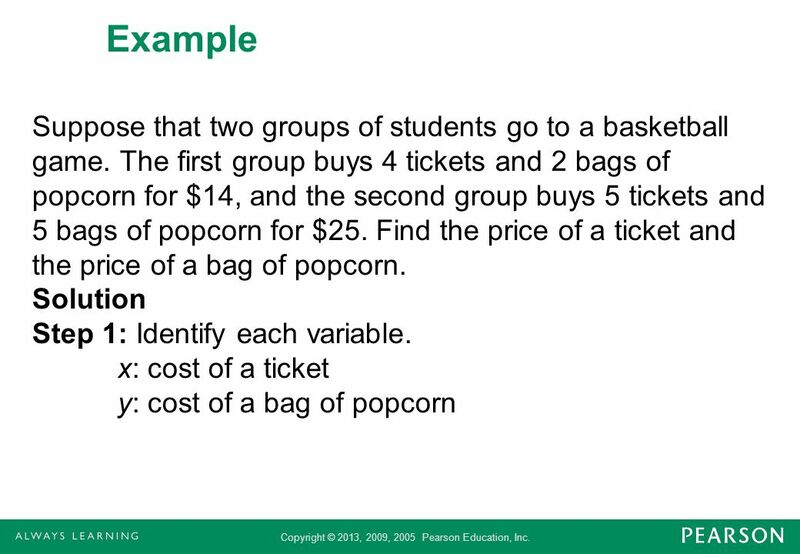 4 Example (cont) b. Solve the first equation for y. Substitute x = 2 into 3x + y = 5. The solution is (2, 1). 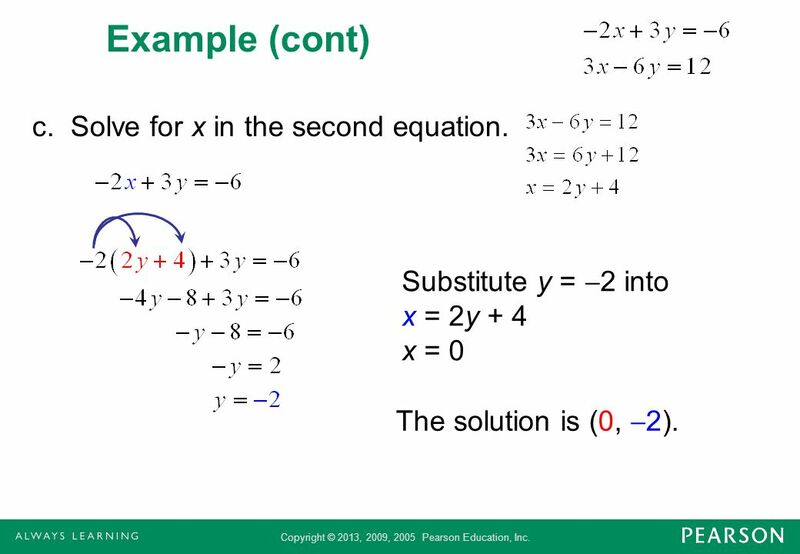 5 Example (cont) c. Solve for x in the second equation. Substitute y = 2 into x = 2y + 4 x = 0 The solution is (0, 2). 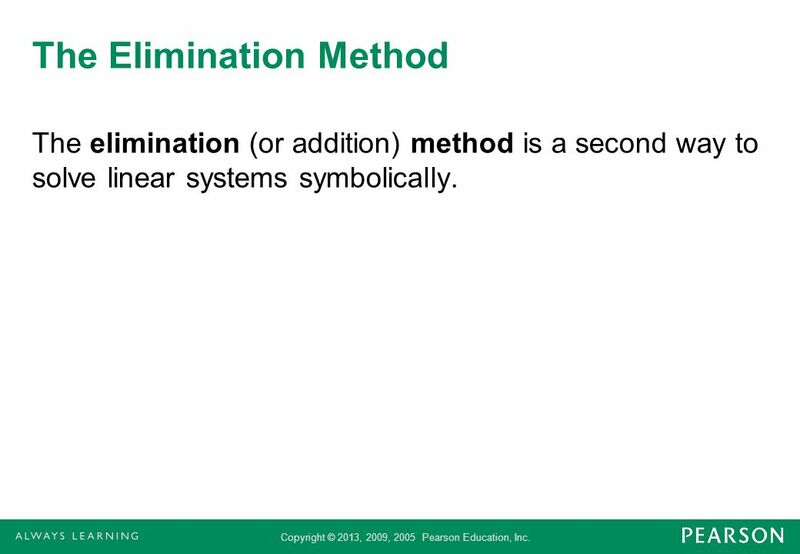 The elimination (or addition) method is a second way to solve linear systems symbolically. 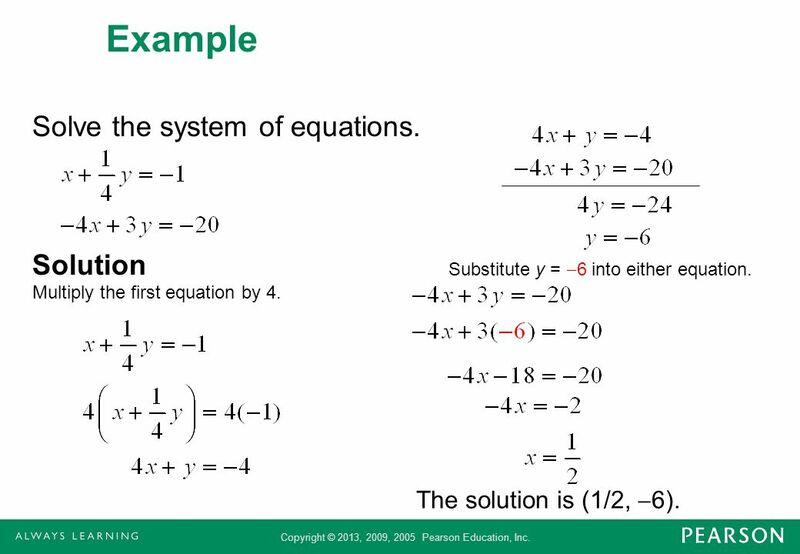 7 Example Solve the system of equations. 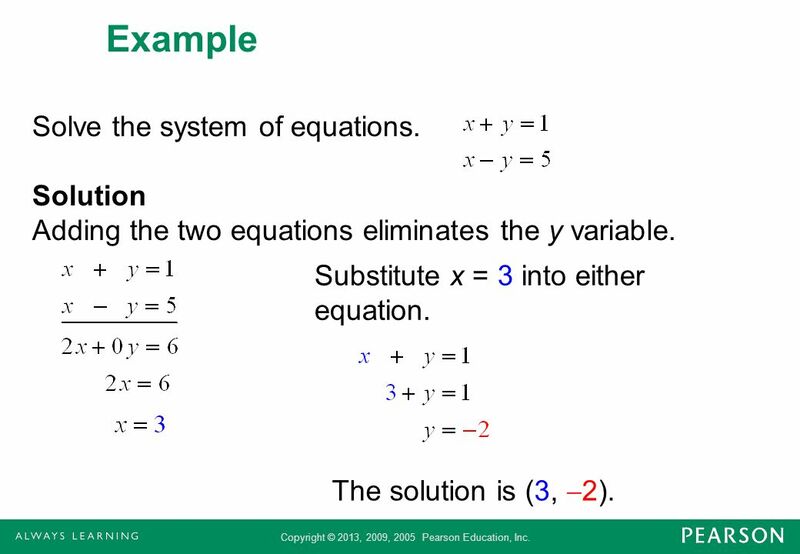 Solution Adding the two equations eliminates the y variable. Substitute x = 3 into either equation. The solution is (3, 2). 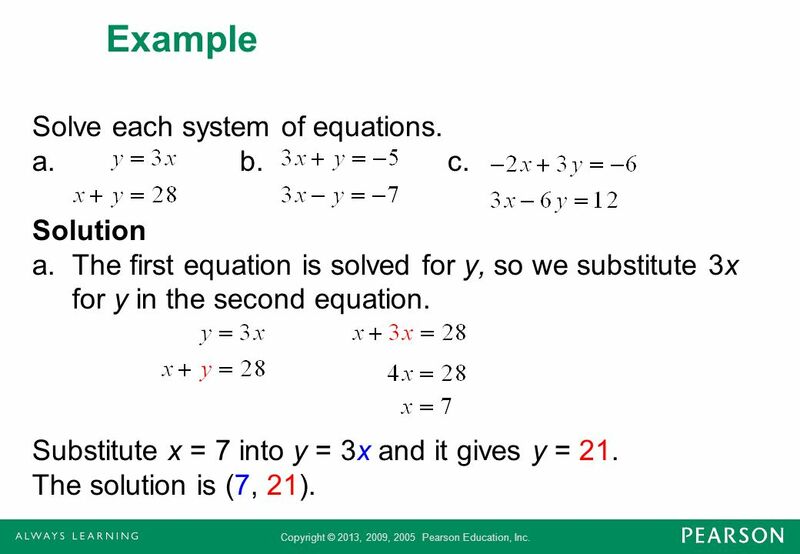 8 Example Solve the system of equations. Solution If we multiply the first equation by 1 and then add, the x-variable will be eliminated. Substitute y = 4 into either equation. The solution is (2, 4). 9 Example Solve the system of equations. Solution Multiply the first equation by 2 and the second equation by 3 to eliminate y. Substitute x = 1 into either equation. The solution is (1, 3). Multiply the first equation by 4. Substitute y = 6 into either equation. The solution is (1/2, 6). 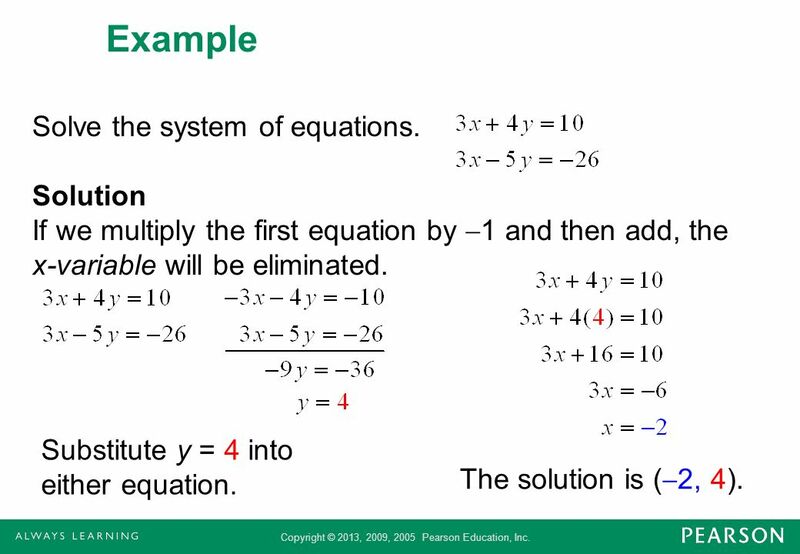 11 Example Use elimination to solve the following system. Solution Multiply the first equation by 3 and then add. The statement 0 = 0 is always true, which indicates that the system has infinitely many solutions. The graphs of these equations are identical lines, and every point on this line represents a solution. 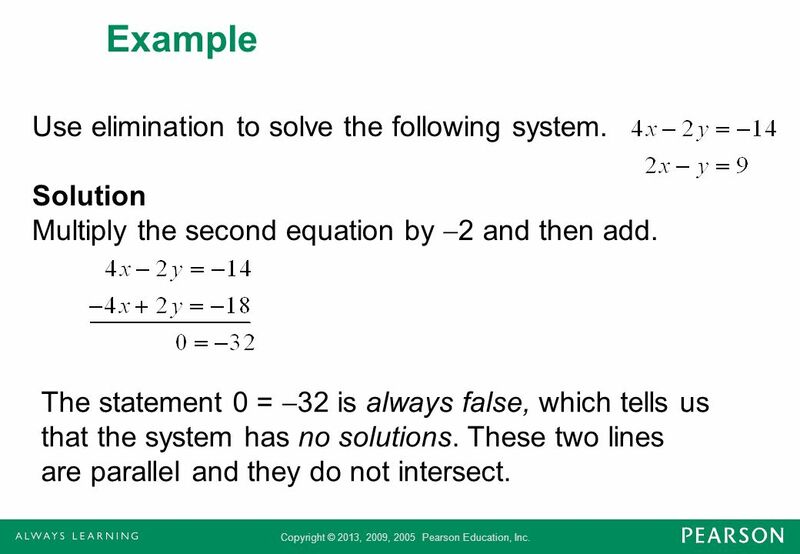 12 Example Use elimination to solve the following system. Solution Multiply the second equation by 2 and then add. The statement 0 = 32 is always false, which tells us that the system has no solutions. These two lines are parallel and they do not intersect. 14 Example (cont) The boat travels 72 miles in 6 hours upstream. 72/6 = 12 miles per hour. 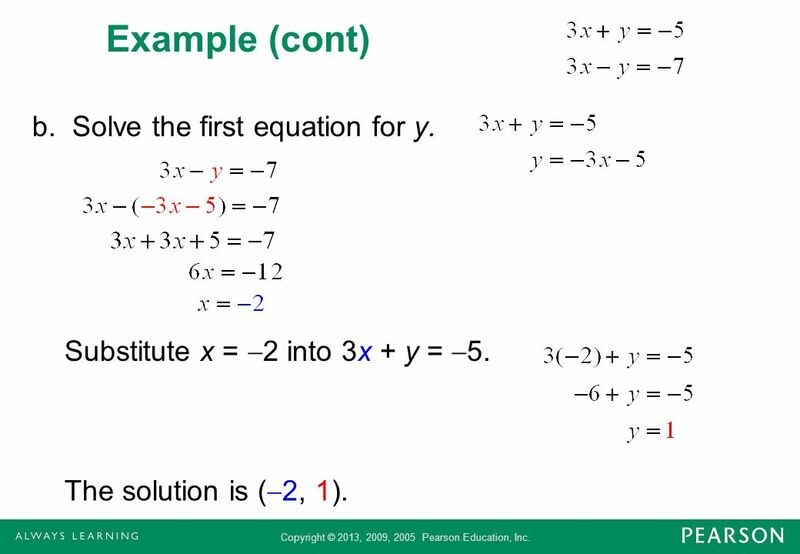 x – y = 12 Step 3a: Solve the system of linear equations. Step 3b: Determine the solution to the problem. The rate of the stream is 3 mph. 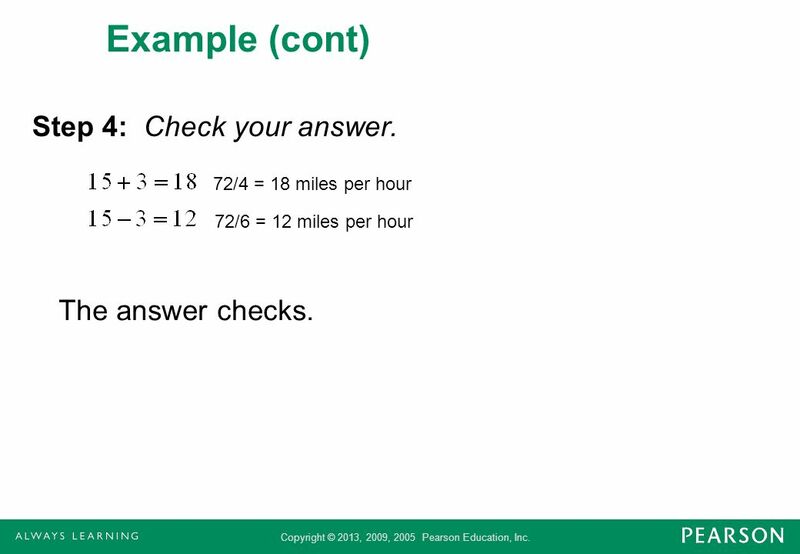 15 Example (cont) Step 4: Check your answer. The answer checks. 72/4 = 18 miles per hour 72/6 = 12 miles per hour The answer checks. Step 3: Determine the solution to the problem. The tickets cost $2 each and a bag of popcorn costs $3. Step 4: Check the solution. The first group purchases 4 at $2 each and 2 bags of popcorn at $3 each which is equal to $14. The second group purchases 5 tickets at $2 each and 5 bags of popcorn for $3 each and this does total $25. The answers check. 20 Example Walt made an extra $9000 last year from a part-time job. He invested part of the money at 10% and the rest at 6%. He made a total of $780 in interest. How much was invested at 6%? 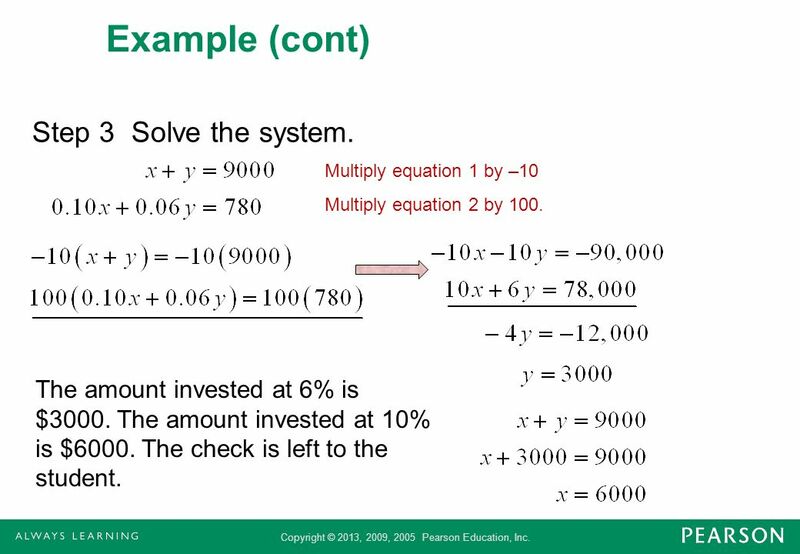 Solution Step 1 Let x be the amount invested at 10% Let y be the amount invested at 6% Step 2 Write the data in a system of equations. 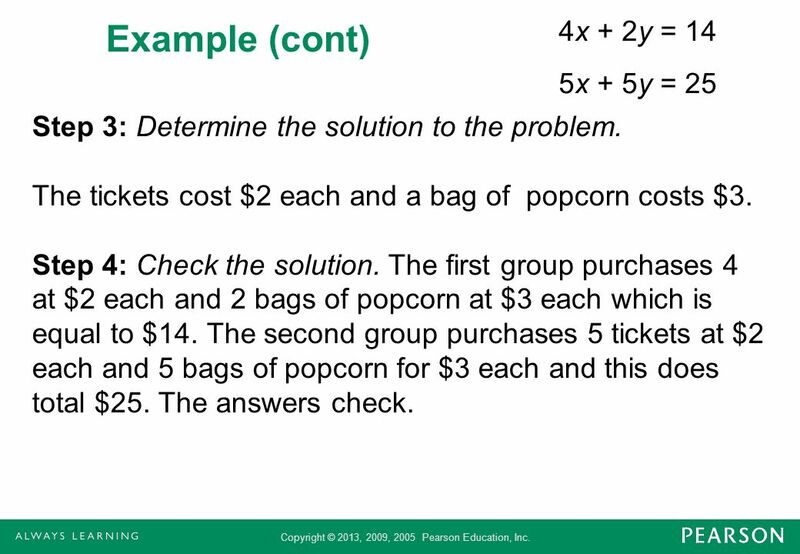 21 Example (cont) Step 3 Solve the system. Multiply equation 1 by –10 Multiply equation 2 by 100. The amount invested at 6% is $3000. The amount invested at 10% is $6000. The check is left to the student. 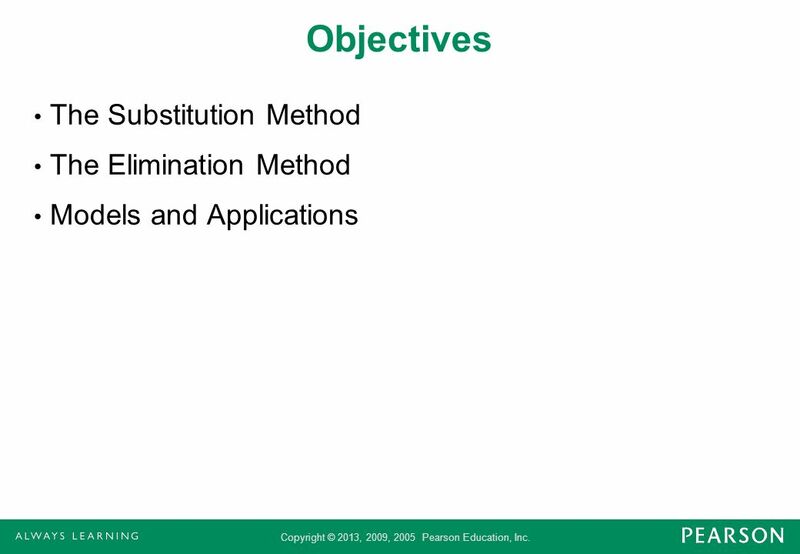 Download ppt "The Substitution and Elimination Methods"
Copyright © 2013, 2009, 2005 Pearson Education, Inc. Section 2.2 Linear Functions. 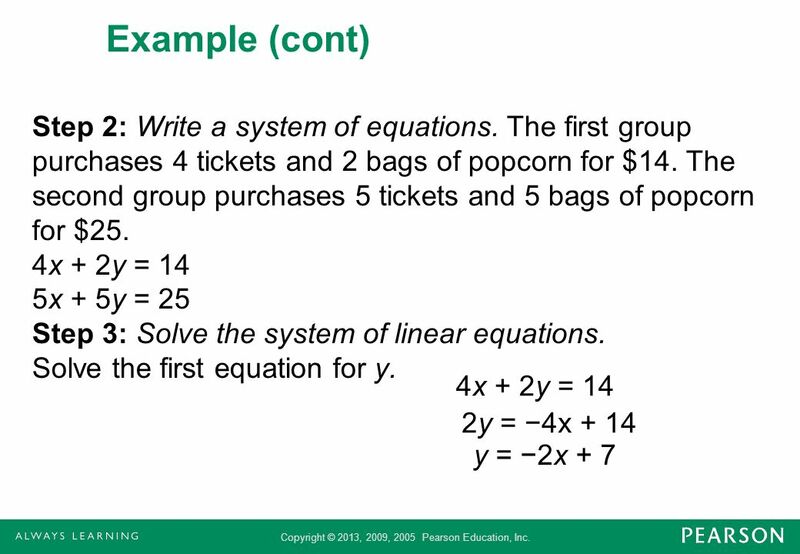 Copyright © 2010 Pearson Education, Inc. Systems of Linear Equations in Three Variables Learn basic concepts about systems in three variables Learn basic. 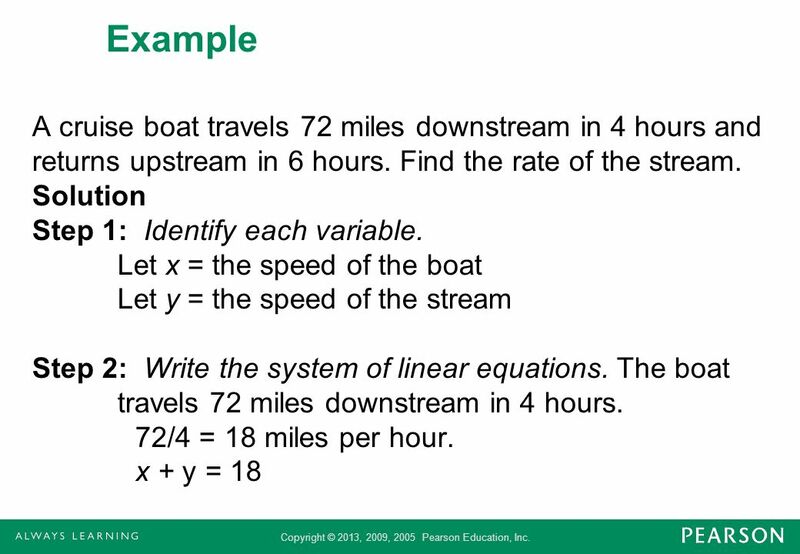 § 3.2 Problem Solving and Business Applications Using Systems of Equations. 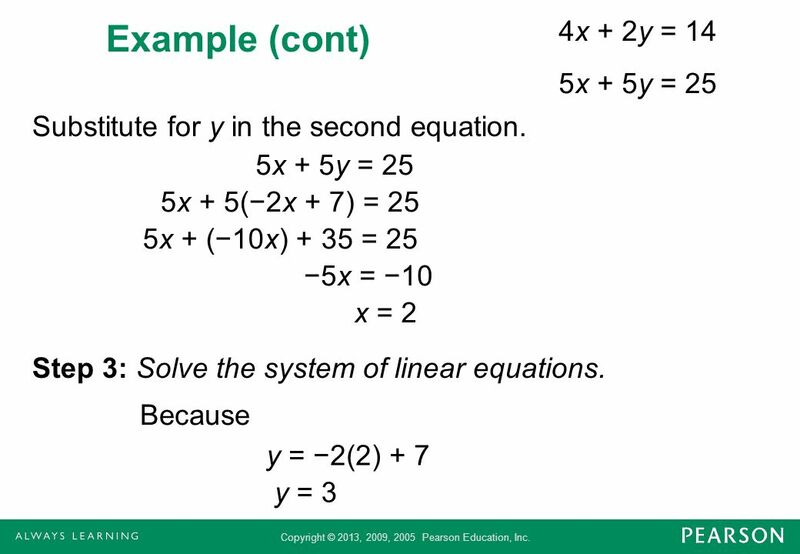 Chapter 4 Systems of Linear Equations in Two Variables. 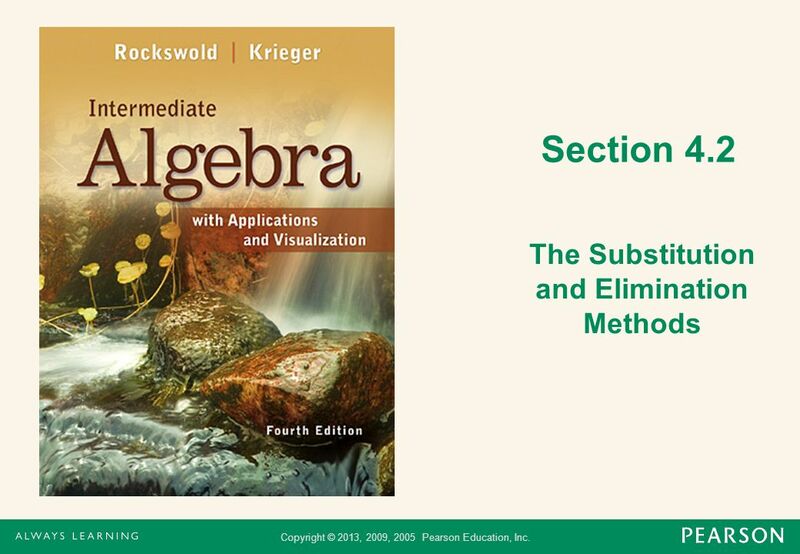 Copyright © 2008 Pearson Education, Inc. Publishing as Pearson Addison-Wesley Systems of Linear Equations in Three Variables Solve linear Systems with. 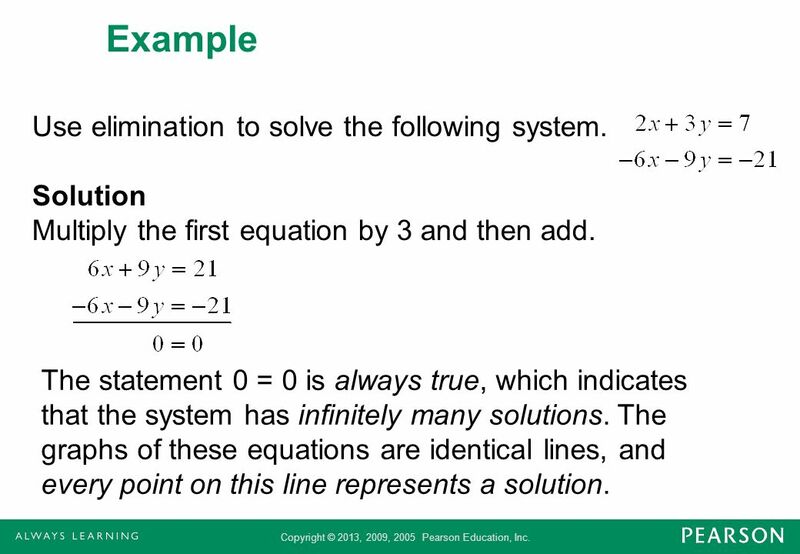 SOLUTION EXAMPLE 1 A linear system with no solution Show that the linear system has no solution. 3x + 2y = 10 Equation 1 3x + 2y = 2 Equation 2 Graph the. 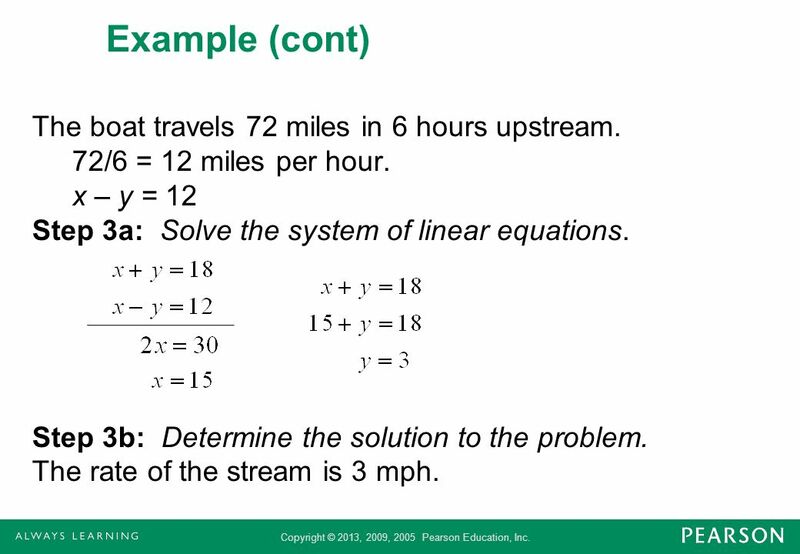 Algebra 7.3 Solving Linear Systems by Linear Combinations. 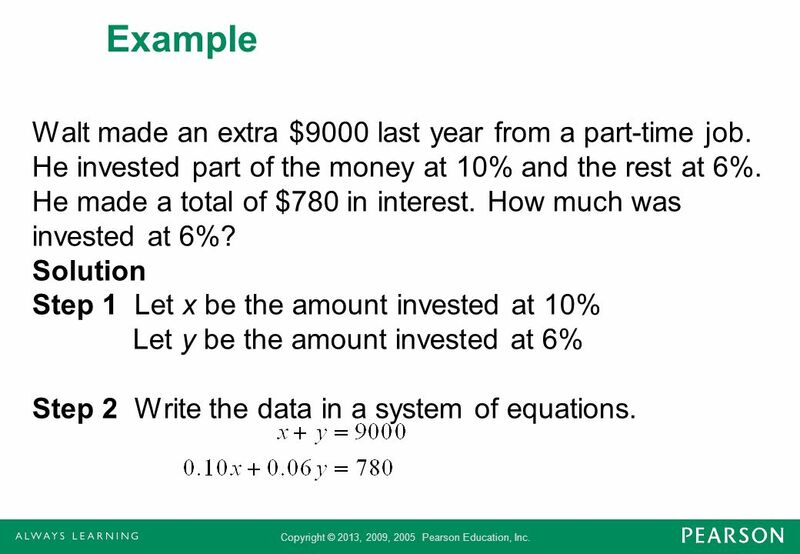 Chapter 4 Section 2 Copyright © 2011 Pearson Education, Inc.
Warm-Up Solve the system by graphing y = x + 2 x = −3 Solve the system by graphing 4x + y = 2 x − y = 3.